Mouse anti Human AKR1B1 antibody recognizes the aldose reductase, also known as Lii5-2 CTCL tumor antigen, aldehyde reductase 1, aldo-keto reductase family 1 member B1, ADR, or low Km aldose reductase. AKR1B1 gene encodes a member of the aldo/keto reductase superfamily, which consists of more than 40 known enzymes and proteins. This member catalyzes the reduction of a number of aldehydes, including the aldehyde form of glucose, and is thereby implicated in the development of diabetic complications by catalyzing the reduction of glucose to sorbitol. Multiple pseudogenes have been identified for AKR1B1. The nomenclature system used by the HUGO Gene Nomenclature Committee to define human aldo-keto reductase family members is known to differ from that used by the Mouse Genome Informatics database (provided by RefSeq, Feb 2009). 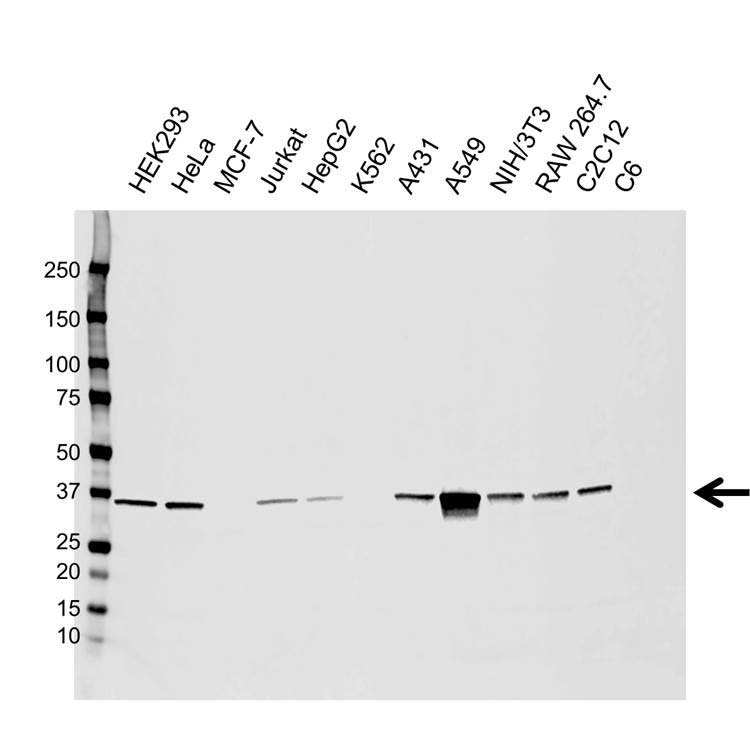 Mouse anti Human AKR1B1 antibody detects a band of 36 kDa. The antibody has been extensively validated for western blotting using whole cell lysates.